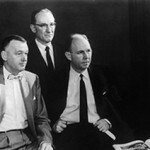 The founders of EG&G: Herb Grier, Ken Germeshausen and Harold Edgerton. I worked at EG&G — of which the ‘E’ is the Doc Edgerton force — for 13 years back in the 1970-80’s. What I remember most about Doc Edgerton was not so much his amazing work in science that came so naturally to him, but his grace, compassion, his elegance, and the way he presented himself to ALL people that worked directly or indirectly for him at EG&G. Every year they (Doc E., Doc Grier, and Doc Germeshausen) would throw their annual year end party and expected all to attend, and there would be no no shows. All three gentlemen would visit each table individually and tend to recognize you not as a subordinate but as an equal. They would make you feel like you were the most important person that night. Doc E. was most impressive and inspiring to all that were lucky enough to have known him, especially myself. I will always remember the man. This entry was posted on Monday, March 19th, 2012 at 5:28 pm and is filed under Personal stories. You can follow any responses to this entry through the RSS 2.0 feed. Both comments and pings are currently closed.